Despite his northern Florida drawl and laid back demeanor, there's a discernible ebullience in Tom Petty's voice as he talks about the current state of his music and his band. 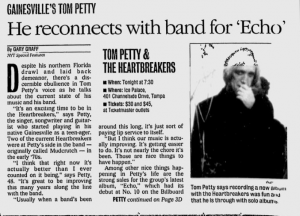 "It's an exciting time to be in the Heartbreakers," says Petty, the singer, songwriter and guitarist who started playing in his native Gainesville as a teen-ager. 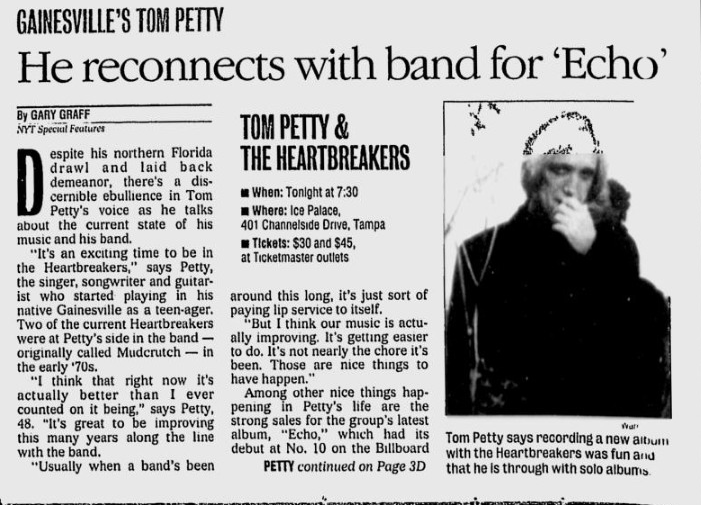 Two of the current Heartbreakers were at Petty's side in the band -- originally called Mudcrutch -- in the early '70s. "I think that right now it's actually better than I ever counted on it being," says Petty, 48. "It's great to be improving this many years along the line with the band. "Usually when a band's been around this long, it's just sort of paying lip service to itself. "But I think our music is actually improving. It's getting easier to do. It's not nearly the chore it's been. Those are nice things to have happen." The record includes 15 sinewy, tightly-performed songs that convey a sense of looseness and space within the parameters of their careful arrangements. The album is a testament to the resilience and allegiance Petty and the Heartbreakers now feel toward one another. It was just a decade ago that Petty recorded his first solo album, the multimillion-selling "Full Moon Fever." Its success seemed to herald a period of creativity without the Heartbreakers. The band had cause to worry, and fans wondered whether real heartbreaker might be in store for the unit, particular in light of angry statements to the press made by Heartbreakers drummer Stan Lynch after he had split from the band. "There may have been some concern ... that I was drifting away, but I wasn't, really," Petty says. "I've always felt like a member of the band, and I think they treated me like a member of the band." During the past 10 years, however, Petty has alternated between Heartbreakers albums ("Into the Great Wide Open" in 1991 and "She's The One" in 1996), solo projects ("Wildflowers" in 1994) and occasional work with the Traveling Wilburys, the ad hoc supergroup that features Bob Dylan, George Harrison, and Jeff Lynne. Petty says the wizened quartet, which originally included the late Roy Orbison, may come out of retirement and put together another album in 2000. The outside projects, in fact, actually outsold his albums with the Heartbreakers, save for a 1993 "Greatest Hits" set. But with "Echo," there's a palpable sense of reconnection, and Petty now says he's through with solo albums. "I think in 25 years together, you're going to go through some hills and valleys, you know," he says, citing other tensions that arose when the band began to experience success with hits such as "Breakdown," "Refugee," "The Waiting" and "You Got Lucky." "We became sort of victims in our own success in some way, in that when we did play it was usually in a giant place ... with all those expectations and preconceptions people had," Petty says. The antidote to stadium tours came in the form of a 20-show residency at San Francisco's fabled Fillmore Auditorium in early 1997. There, the Heartbreakers tinkered with set lists, playing seldom-heard album cuts and spontaneously performing cover songs. It was great fun, Petty says, allowing the musicians to play as a unit again and "reconnect with something." "We felt like we had a really good rock 'n' roll band, and we were kind of glad to be in it," he says. Instilled with that spirit, Petty and the Heartbreakers -- guitarist Mike Campbell, bassist Howie Epstein and keyboardist Benmont Tench, plus cohorts Steve Ferrone on drums and Scott Thurston on guitar and bass -- set to work on "Echo." 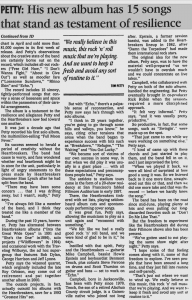 Campbell, born in Jacksonville, has been with Petty since 1970. Tench, the son of a retired Alachua County circuit judge, is a Gainesville native who joined not long after. Epstein, a former session bassist, was added to the Heartbreakers lineup in 1982, after "Damn the Torpedoes" had made them international rock stars. The original idea for the new album, Petty says, was to have the material well-prepared "so we wouldn't have to overdub much and we could concentrate on live takes." Campbell, who collaborated with Petty on both of the solo albums, handled the engineering. But Petty eventually brought in co-producer Rick Rubin when the sessions required a more disciplined approach. "It felt very informal," Petty says, "and it was usually pretty productive." So productive, in fact, that some songs, such as "Swingin'," were made up on the spot. "That just came to me while we were working on something else," Petty says. "I kind of came up with these chords and started to play them, and the band fell in on it, and I just improvised the lyric. "When we played it back, we were all kind of surprised at how good a song it was. So we listened back to it one more time, straightened out this or that, and then we did one more take and that was the record -- before we hardly knew the song." The band has been on the road since mid-June, playing plenty of hits and even pulling out long-discarded favorites like "Don't Do Me Like That." 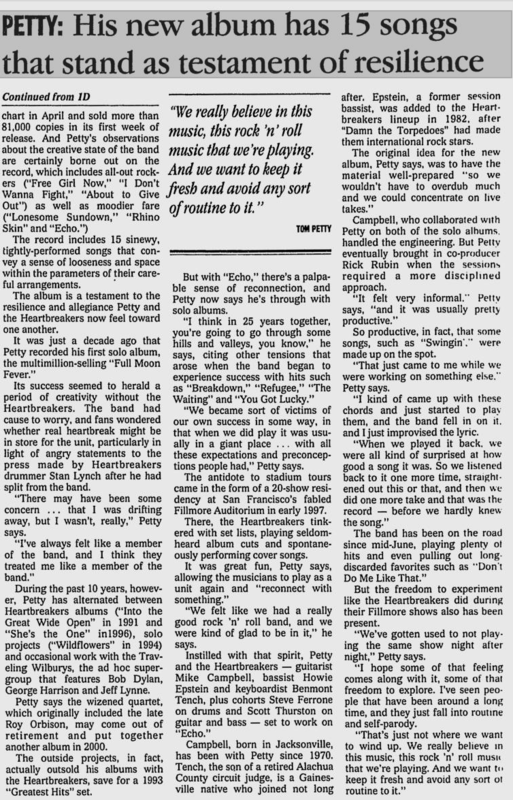 But the freedom to experiment like the Heartbreakers did during their Fillmore shows also has been present. "We've gotten used to not playing the same show night after night," Petty says. "I hope some of that feeling comes along with it, some of that freedom to explore. I've seen people that have been around a long time, and they just fall into routine and self-parody. "That's just not where we want to wind up. We really believe in this music, this rock 'n' roll music that we're playing. And we want to keep it fresh and avoid any sort of routine to it."